hotel address: Blazimska 4, Prague 11 - Chodovec. TOP HOTEL Praha & Congress Centre is exceptional not only for its capacity and size, but also for its congress halls and high standards of accommodation. It is situated in a peaceful milieu in the South Eastern district of Prague. The TSC 2003 Conference and pre-conference tutorials will take place in its three large Congress halls and meeting rooms. Lunches will be served at the Hotel Restaurant and our Welcome Party will be held in the Japanese garden which is surrounded by summer terraces and includes a singing fountain. 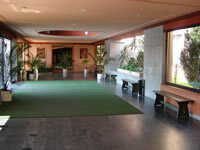 Other available facilities and amenities: a tennis court, table tennis, bowling, fitness centre, sauna and parking. TSC 2003 information desk at the Prague-Ruzyne Airport (located just opposite to the exit gates No. 1, 2, 3 next to the taxi info desk), will be open on Saturday, July 5, 2003 and on Sunday, July 6, 2003 from 10:00 till 21:00. Our hostess will be there to assist you with transportation to the Top hotel Praha. To reach the conference site (TOP Hotel Praha) directly from the airport we recommend that you take microbus CEDAZ offering door-to-door service for 1-4 persons for a fixed price of 720 CZK. The CEDAZ stand is located in front of the Airport arrival exit (outside) to the right of the taxi stand. It is also possible to use public transport: Board bus No. 119 which will take you from the airport to the metro (subway) station Dejvicka on metro line A (the green line). At Dejvicka board the subway train and travel to the Muzeum station stop. Get off the train there and transfer to the metro line C (the red line) and board the train travelling in the direction H�je. Proceed to the Chodov metro station stop and get off the train there. At Chodov there is also a bus station where you will board bus No. 115 and travel to the stop Keblovsk�, which is located across the street from the conference venue - TOP Hotel Praha. Tickets for public transport cost 12 CZK and can be bought in the newspaper stand at the airport. The ticket price includes all transfers. By taxi: Taxi fares in Prague start at 25 CZK base fare plus 22 CZK per one kilometre. If you arrange your cab with a taxi stand on the airport, it should get you to the hotel for a fixed price of 770 CZK (there is also a possibility to pay ahead by a card). Otherwise the prices are not easily predictable. It is likely that hotel taxis might offer different rates. From the main train station Hlavni nadrazi or from Nadrazi Holesovice board the subway (metro line C) and proceed to Chodov station stop and get off the train there. At Chodov there is also a bus station where you will board bus No. 115 and travel to the stop Keblovsk�, which is located across the street from the conference venue - TOP Hotel Praha. Coming this way you need to purchase a ticket for public transport for 12 CZK which you can buy in a newspaper stand or in the yellow machine in the entrance hall to the subway. The ticket price includes all transfers. Excellent public transportation in Prague is provided by metro (subway), trams, and buses from 5 a.m. till midnight, and by night trams (non-stop). Tickets can be bought in yellow sales machines (in each metro station) or at newsstands for 12 CZK and are valid for 1-hour and multiple transfers. A one day unlimited use card can be purchased for 70 CZK and a one-week unlimited use card for 250 CZK. You need a valid passport to enter the Czech Republic, even if you are an EU citizen. Citizens of all EU countries, U.S.A., Israel, Japan, and some other countries do not need visas for short-term visits. Since regulations can change, we suggest checking on the website of the Czech the Ministry of Foreign Affairs or with the Czech Embassy or Consulate in your country about regulations for your nationality. Some changes made in visa policy recently are that citizens of some countries (e.g., Canada, Australia) need a visa now.